Children and families who enjoy craft activities will get lots of pleasure from creating their very own designs using Advent calendar kits for kids this year. 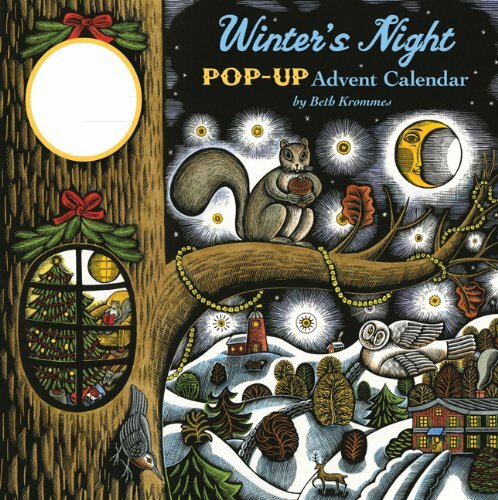 There are some super fun kits and items that you can buy in order to make a unique way to countdown the days until the Christmas Holiday season. These kits to create Advent Calendars can also make great gifts or items to really enjoy during those colder Fall season months. Leading up to the beginning of December, these are fun crafts and activities that can be enjoyed by kids and also all the family with the make and do style designs. Some of the kits and ideas here can be enjoyed by a child independently depending on their age and ability. Others make for enjoyable ways to spend some quality time together as a family. I know how much I enjoy doing fun art and craft projects with my own daughter, and we always have the most fun in the run up to the Holiday season. What a fantastic pre-Christmas craft this ought to make. 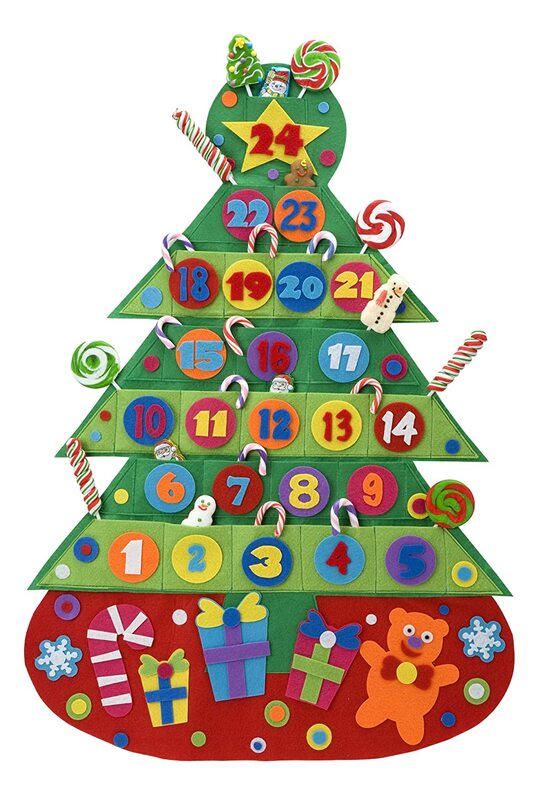 Children from as young as 5 and families can enjoy decorating this hanging felt Advent tree by Alex Toys. The kit comes with the felt tree base and pockets already sewn on so there is no sewing to do which makes it even easier. ⭐ There are 150 pre-cut felt shapes with a sticky adhesive backing that can be used to decorate the Advent calendar shaped tree. That means there is no mess involved with this craft because you're not having to use glue to stick anything. There are 24 small felt pockets that need to be numbered. A younger child may need a little supervision with number recognition. Help may be needed with the ordering of the numbers to go on the design. There are other felt shapes with sticky adhesive backing that are ready to place on the tree in order to decorate it. This is a lovely way to get a child to have their own personalized calendar. If you have some letter stickers of your own then you could also use those to spell out the child's name on the Christmas tree as well. This really looks like it is a fun seasonal craft activity. Once it has been made, the felt Advent calendar can be re-used year after year and it can become a lovely part of your family's own Holiday tradition. The other nice feature is that it is totally up to you what you fill the pockets with. If you want a no-candy or no-chocolate design, you can have it! 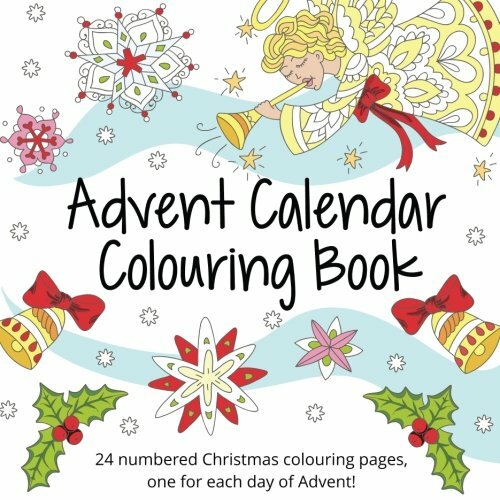 Lots of ideas here on how to fill advent calendars with items other than candy! The felt tree craft kit above needs to be made well before December so that it can be used and enjoyed. 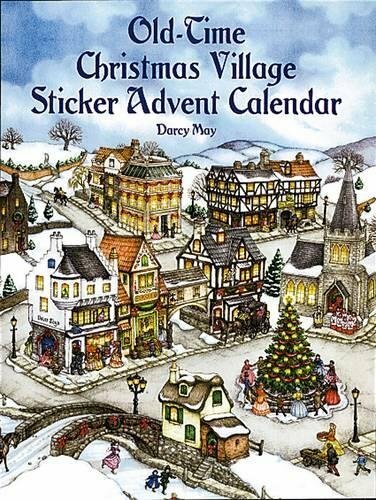 This old-fashioned and beautifully traditional Christmas Village sticker calendar is something that you can just open and use right from the 1st of December. There's nothing to pre-make with it at all. With this wonderful looking sticker set, you need to carefully remove the interior sticker sheets and staples to reveal the charming Victorian village scene on the inside front and back cover of the book. ⭐ Each day through December, the child can enjoy adding a numbered sticker illustration to the scene which means that the pretty picture emerges gradually through-out the whole month. The final sticker is a tree which is applied on the 25th of December. 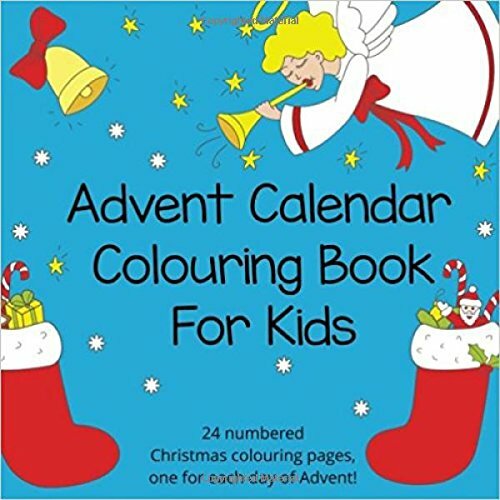 Children and adults who enjoy sticker scenes should really like this novel Advent Calendar idea and the whole family can enjoy the finished result on Christmas day. Some people are lucky enough to be able to carefully peel the stickers back off after the Holiday season and pop them back on the sticker sheet to apply again. One family had used theirs for 4 years before the stickers lost their tack and they came back to buy another. So that tells me how enjoyable this item is. This set involves a bit more of a challenge. 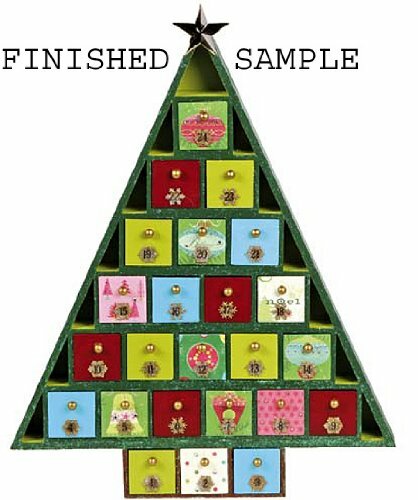 It comes with a pre-made wooden box tree of little drawers: a wooden Christmas tree which is blank and ready to be decorated. You'll need to start this well before December because I think it will take a number of craft sessions for a child to paint and decorate it all. ⭐ For an older child or a family working together, this provides a good solid crafting activity since you can paint all the drawers individually in different colors if you like. Once the paint is dry then you could use some Holiday themed stickers to decorate the drawers further. The finished result should be a lovely and unique wooden set that can be brought out year on year. You could add little surprises in the drawers too if you wanted to. I think this is a lovely keepsake idea. 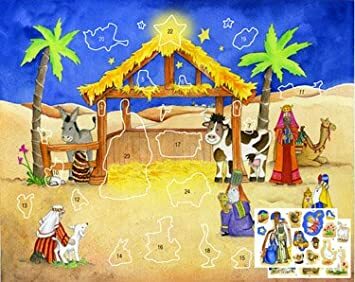 My own daughter loves her sticker books and has many different types but we haven't thought about an Advent sticker scene until I spotted these at Amazon. I didn't even know they existed. I'd prefer to give her a craft type activity to count down the days until Christmas rather than giving more chocolate or candy treats which are in abundance during the Holiday season anyway. So I think these are a great and inexpensive solution. A great way to remind children what the season is all about is with a Nativity scene. 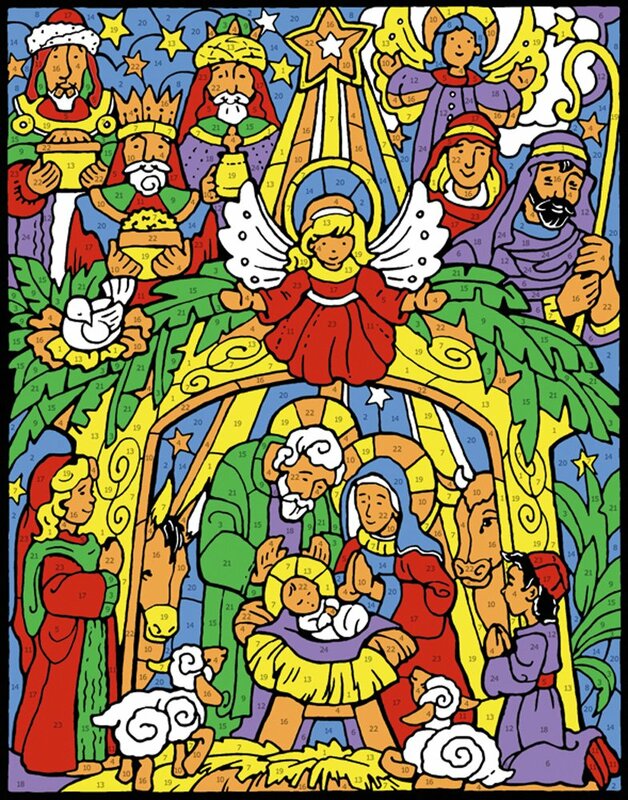 Children should enjoy coloring a section of this religious scene every day to build up the story of Jesus. And if they are doing the Nativity play at school, this will help to teach them what it is all about while having fun at the same time. Hi, I'm Marie. TinselBells is a site for people like me who simply love Christmas Holiday decorations and festive gifts. Discover my guides on decorating different rooms in your home and ideas on what to shop for and buy with that all-important seasonal theme. 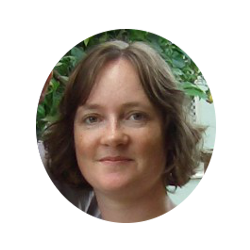 Follow Crafty Marie's board All About Christmas on Pinterest. TinsellBells.com is a participant in the Amazon Europe S.à r.l. Associates Programme, an affiliate advertising programme designed to provide a means for sites to earn advertising fees by advertising and linking to Amazon.co.uk.